After stunning one million California spectators in Los Angeles, San Francisco, San Jose, San Diego and Orange County with its original show Cavalia and its second theatrical adventure Odysseo, the internationally acclaimed entertainment company Cavalia Inc. has announced the first visit of Odysseo to Ventura County. The world’s largest touring production will be presented under its signature White Big Top in Camarillo, US 101 at Santa Rosa Rd (Exit 52). Performances will start Saturday, November 11, and Odysseo will call Ventura County home through Thanksgiving with matinee and evening shows scheduled until November 26. Tickets for Odysseo in Ventura County are now on sale and can be purchased online at http://www.cavalia.com or by calling 1-866-999-8111. The $30 million equestrian and acrobatic extravaganza expands the definition of performance into an epic, yet soulful theatrical experience. A show unlike any other on the planet, this awe-inspiring production features 65 magnificent horses and 50 talented riders, acrobats, aerialists, dancers and musicians. Odysseo is the masterpiece of Normand Latourelle, creator of Cavalia Inc. and renowned for combining different forms of artistic expression and reinventing the scenic space. 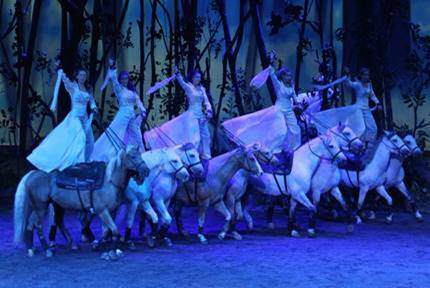 Odysseo is a heart racing live performance, filled with mesmerizing visuals and live music. Through the magic of digital projection, audiences of all ages will be transported on an epic journey to some of nature’s greatest wonders including the Mongolian steppes to Monument Valley, the African savannah to Nordic glaciers, and from the Sahara Desert to Easter Island. Odysseo’s mindboggling theatrical effects are as spectacular as they are numerous: a state-of-the-art video screen three times the size of the world’s largest cinema screens; a three-story mountain for dazzling perspectives; décor both intricate and grandiose that seems to pull the audience onto the gigantic stage, and a real lake made of 40,000 gallons of recycled water which magically appears for a splashing finale. In sum, the show creates places no one has ever seen before – places where one can feel the deep connection between horse and man. Odysseo’s horses play in complicity and with freedom, in a respectful relationship with their human counterparts, creating a moving artistic and emotive partnership. A liberty number, in which purebred Arabian horses are directed only by the soft murmurs of their trainer, and a fabulous caravan act that comprises people and horses too numerous to count, are amongst the breathtaking scenes that will leave every spectator captivated and touched. 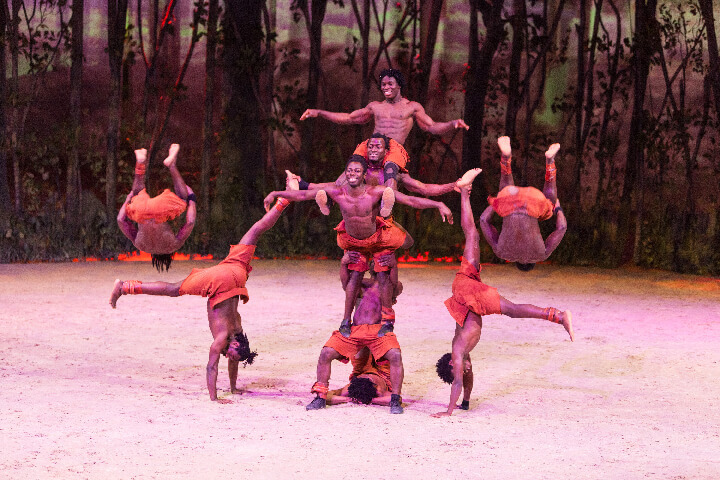 Showcasing their extraordinary talents, the acrobats present a mix of force and sensitivity, interacting with the spellbound audience, while the live musicians and a vocalist perform in the most enthralling way to immerse spectators in a beautiful, multi-sensory experience. Whether it is the dexterity of the African acrobats, the enchanting sound of the Kora, or the majestic life-size merry-go-round, the cast and set of Odysseo are inspired and inspiring, delivering crowd-pleasing wonders and stunts. Wowing critics and audiences alike across North America since its Montreal premiere in 2011, Odysseo will conclude its engagement in Nashville, TN, before moving its signature White Big Top for the first time to Ventura County in November. TICKETS – BUY NOW AND ENJOY “PRESALE” PRICES – FOR A LIMITED TIME ONLY, up to 15% discount is applied automatically for online and phone transactions for ticket purchases. The presale ticket prices range from $29.50 to $119.50 + applicable fees. For a memorable outing, the Rendez-Vous package offers the best seats in the house, a full meal buffet dining before the show, open bar, desserts during intermission and an exclusive visit to the stables after the show. This unique VIP experience takes place in a tent alongside the White Big Top. The presale Rendez-Vous package prices range from $129.50 to $234.50 + applicable fees. Special pricing and packages are also available for groups of 12 spectators and more. 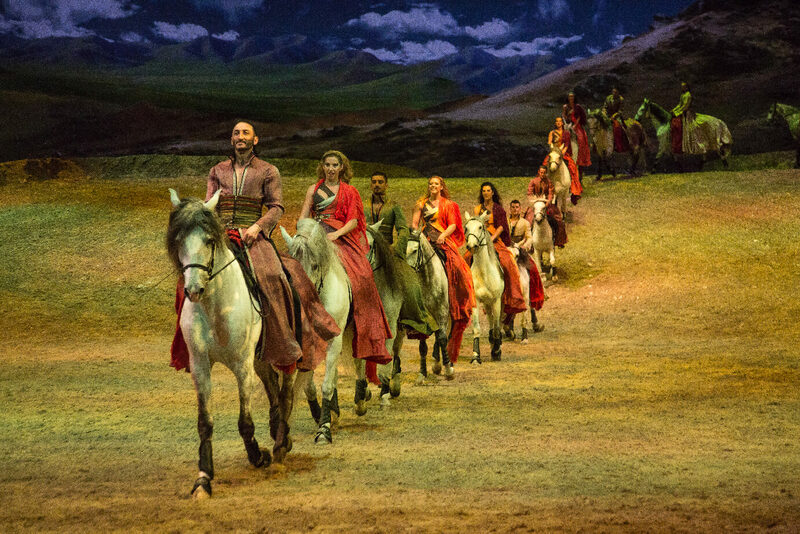 Tickets for Odysseo are available at http://www.cavalia.com or by calling 1-866-999-8111.